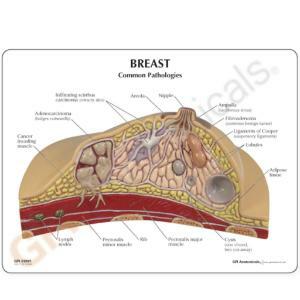 The most common cancer in women is examined here in cross section detail. 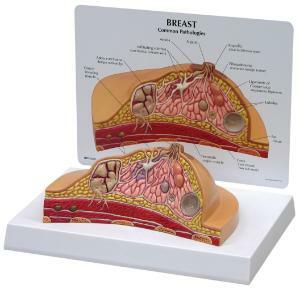 The full size breast model depicts adenocarcinoma, cysts, fibroadenoma, and infiltrating scirrhus carcinoma. By studying the appearance of cancerous tumors and their extent of pemeation into the breast tissue, students will gain a better understanding of how this form of cancer effects a woman’s body. Additional breast structures of suspensory ligaments, fat tissue, lymph nodes, muscles, and ribs are also shown.